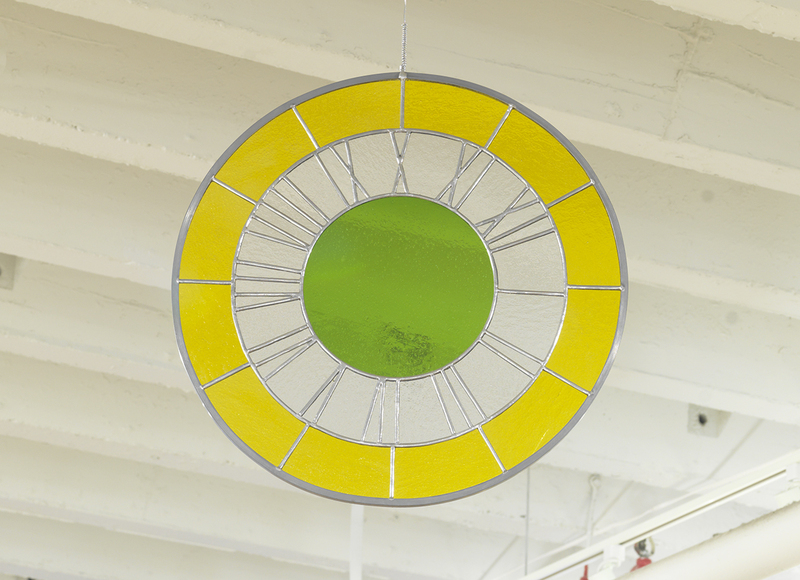 Yellow white green clock (2012) is an abstract stained glass clock face with Roman numerals. It hangs from a wire so that the “X” is where “XII” should be, meaning 12 is actually at 2 o’clock. Placed against a window with a view of Sunset Park, Brooklyn, the clock face transforms the gallery space into a time capsule where time is askew, becoming a Narnia-like parallel time zone, set as an atemporal freeze frame. A transformative boundary is established between the space of the gallery interior, where time is at a contemplative standstill, and outside, which becomes a world away, where time rushes on at its usual pace. Ugo Rondinone, “Yellow white green clock,” 2012. Stained glass window and wire, 19 3/4 x 19 3/4″. Courtesy of the artist and Gladstone Gallery. Photo by Brian Buckley. In Rondinone’s piece, the window provides a plane on which to project the inner mind and so the backdrop of the outside landscape seen through it becomes subjective. It brings to mind the windows in Samuel Beckett’s play Endgame, through which there is an apocalyptic “zero zero zero” for some and bountiful “rising corn” for others. For Beckett’s audience a great gulf opens between the onstage world that they are allowed to perceive, and the offstage world that one of the characters, Clov, alleges exists. In Rondinone’s piece, as in Beckett’s play, the alienation of the mind from others and from reality is a sad, claustrophobic truth. Rondinone’s clock face engages the isolation of each audience member, who must view it in the wake of the catastrophe of Hurricane Sandy. The conjectured isolation of the viewer from empirical truths allows for the objective reality of the outside world to waver: it is seen through the window as two-dimensional, existing on a different scale and a different temporality than the gallery space inside the Surviving Sandy show.